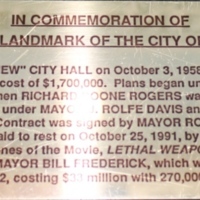 A plaque commemorating the former 1958 Orlando City Hall, which was imploded on October 25, 1991, for the filming of Lethal Weapon 3. The building was replaced by a new one in 1991 as a product of Mayor Bill Frederick’s (b. 1934) efforts to beautify and improve Orlando. The city hall was designed by noted Orlando architect Richard Boone Rogers under the administration of Mayor William Hamer Beardall, Jr. (1890-1984), who served from 1940 to 1952, and the land was acquired during the administration of Mayor J. Rolfe Davis (1904-1988), who served from 1953 to 1956. The building was constructed by Tampa-based firm C. A. Fielland from 1956 to 1958 during the administration of Mayor Bob Carr (1899-1967), who served from 1956 to 1967. Dedicated October 3, 1958, the building served as Orlando’s City Hall until its implosion on October 25, 1991, following the construction of a new city hall less than 10 feet away. Original commemorative plaque: Orlando Remembered Exhibit, Orlando City Hall, Orlando, Florida. "Object 2009.070.0002 - Granite." 1958. Orange County Regional History Center, http://thehistorycenter.pastperfectonline.com/webobject/19C7CEBD-3BF5-48A6-8B24-394179597640. Bill Frederick; Billy Beardall; Bob Carr; city halls; commemorative plaques; demolition; implosions; J. Rolfe Davis; Lethal Weapon 3; mayors; orlando; Orlando City Hall; Richard Boone Rogers; Robert Spencer Carr; Willard Drawn Frederick; William Hamer Beardall, Jr.
“In Commemoration of a Former Landmark of the City of Orlando.” RICHES of Central Florida accessed April 18, 2019, https://richesmi.cah.ucf.edu/omeka/items/show/7862.